Miranda is a Senior Research Manager at YouthSight. 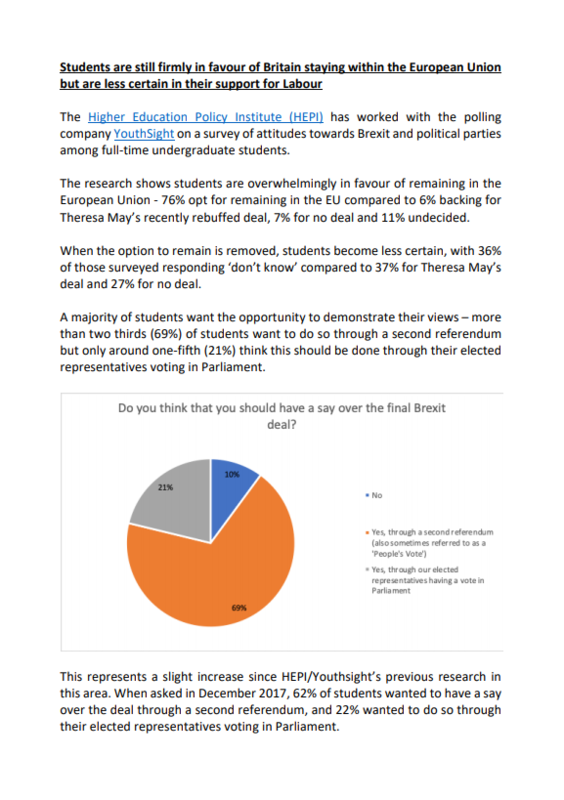 YouthSight has been tracking the political views of students since 2004 and views on Brexit since 2016. Today’s release was sponsored by the Higher Education Policy Institute (HEPI) and is the fifth in an occasional series of YouthSight/HEPI monitors, all of which try and evaluate important topical issues from current students' perspective. The results of this research are based on findings taken from the YouthSight Student Omnibus. [A UK-representative sample of 1048 full time undergraduates at UK institutions. Fieldwork ran from 4th January to 7th January 2019, with findings compared to previous waves of research which took place in September 2018 and July 2018]. Download HEPI's press release here to find out more. We publish full tables for our political research which are available to download here. You can also read our own additional analysis of the data below. Our latest findings show that 80% of students who were eligible to vote in the EU referendum voted for Remain. Of those who were eligible but did not vote in the referendum, 78% would choose Remain if they were given another chance to vote. Students’ pessimism about their future under Brexit has climbed dramatically since our last wave of Brexit research, with 77% now feeling that their prospects after Brexit will change for the worse, compared to 70% who felt this way in September 2018. How do you personally feel your future prospects will be affected by the decision to leave the EU? They will slightly change for the worse/they will significantly change for the worse. An overwhelming 89% of students feel that they should have a say over the final Brexit deal, and this proportion has grown by 6% since September 2018. The majority of this group (68%) believe that they should have their say through a second referendum or people’s vote. Support for a people’s vote has remained at a similar level since July 2018. Do you think that you should have a say over the final Brexit deal? We asked students how they would vote in a second EU referendum, providing a variety of options in different combinations. As the survey took place from the 4th to the 7th January, we included Theresa May’s deal, which was still on the table before the 15th January vote. Were there to be a second EU referendum (i.e. a Peoples vote)  would you vote if you were given the following? Intention to vote Remain in a second referendum is the most popular option in every scenario where it is available, with around 80% choosing this option each time. In these scenarios, Theresa May’s deal was not supported by students, with 10% or less choosing this option. Without the option to choose Remain, students are similarly likely to be unsure as to choose Theresa May’s deal. Almost two thirds of students believe that 16 and 17 year olds should be able to vote in referenda (62%), with 18 - 21 year olds being most likely to support this policy. This support has grown from 56% in September 2018. 59% of students state that Brexit will impact how they vote in a future general election. Examining responses depending on party preference, we see that Liberal Democrat voters are most likely to agree with this, at 76%, followed by Labour voters at 61%, with Conservative voters least likely to agree at 43%. Given the positive impact of the youth vote on Labour’s performance in the 2017 election, this may be most significant for Labour out of the three parties. Liberal Democrat and Labour supporters are most likely to agree that they intend to vote for a party that opposes Brexit. 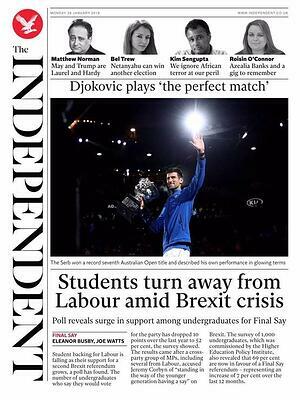 Following on from this, among students who intend to choose a party that opposes Brexit, almost a third state that supporting Brexit is more important to them than the party they actually vote for. 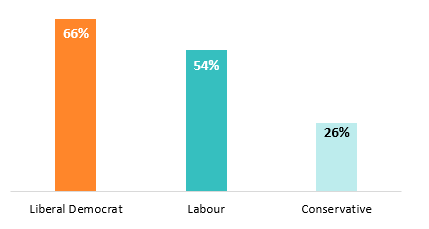 In total, 17% of Labour supporters in our sample held this view. This research was funded and sponsored by Higher Education Policy Institute (HEPI). Questions have been co-developed with HEPI and, in prior waves, by Open Britain. These results are based on findings from YouthSight’s Student Omnibus, the UK’s only weekly dedicated student omnibus survey. Fieldwork ran from 4th January 2019 to 7th January 2019. 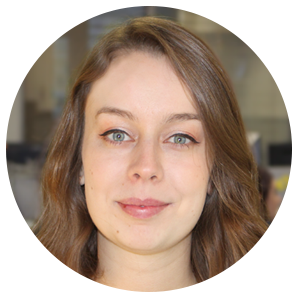 Each YouthSight Student Omnibus is based on at least 1,000 complete interviews with full-time undergraduates at publicly funded higher education institutions in the UK. Quotas are set for course year (1,2,3+), gender and university type (Russell group, pre 1992 universities, post 1992 universities and specialist institutions). Targets for the quotas are acquired using current data supplied by the Higher Education Statistics Agency (HESA). Weights are also occasionally used to ensure the sample is fully representative. All completers received a credit of £1.67 in shopping voucher credits. All participants are members of The OpinionPanel Community, YouthSight’s proprietary research panel, comprised of over 150,000 members aged 16 to 30 including 80,000 students. YouthSight was established in 2004. We help clients see the world through the eyes of young people, students and young professionals. Our Insight teams help brands, policy-makers and universities. Our Panel and Data Services team helps market research and advertising agencies. 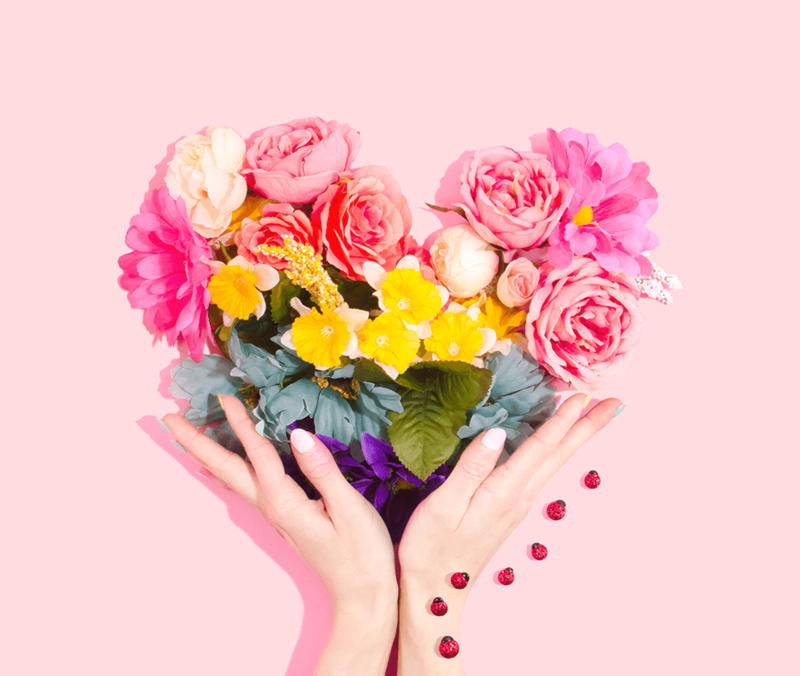 Findings from YouthSight are regularly in the news, helping to fuel debates around students, Gen Z and Millennials, trends in higher education and best practice in youth research. We own and manage The OpinionPanel Community – the UK’s largest youth research community, comprised of over 150,000 16-30-year olds.